Gideon's gut wrenched as the enormity of the slaughter pressed itself on his mind. Vorik's purple banner flapped in the wind that wheezed down the ravine and stirred chalky dust and black ash into whirling eddies across the blasted ground. Smoke still rose from glowing embers here and there, where campfires had spread in the chaos to engulf whatever other shelters the defenders had built. 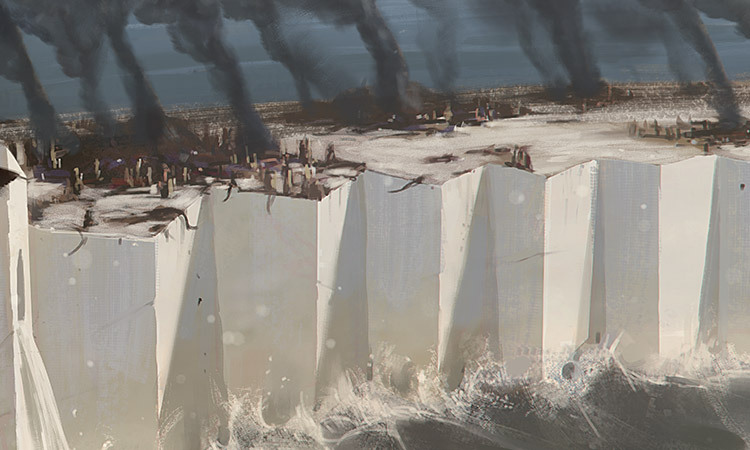 The Eldrazi corruption covered the ground, an intricate meshwork of thin white filaments. Some looked like the casualties of any other war, blood soaking their chests and streaking their faces, limbs torn free, gore spilling from gaping gut wounds. But more—so many more—had partially crumbled away, leaving heaps of dust where heads or legs or arms had been. The smell of blood and entrails mixed with the carrion odor of the Eldrazi and turned Gideon's stomach. During the final assault on Sea Gate, Commander Vorik had established a camp here, a refuge for the people fleeing the advancing Eldrazi. Last Gideon knew, it had been safe—or as safe as anyplace on Zendikar. It was sheltered in a narrow ravine that's mouth was almost blocked by a huge fallen hedron. If nothing else, the hedron served to choke off the approach to the camp, but Vorik had seemed to put some stock in the hedron's magical ability to ward off the Eldrazi as well. But Vorik's camp was clearly no longer a safe refuge. 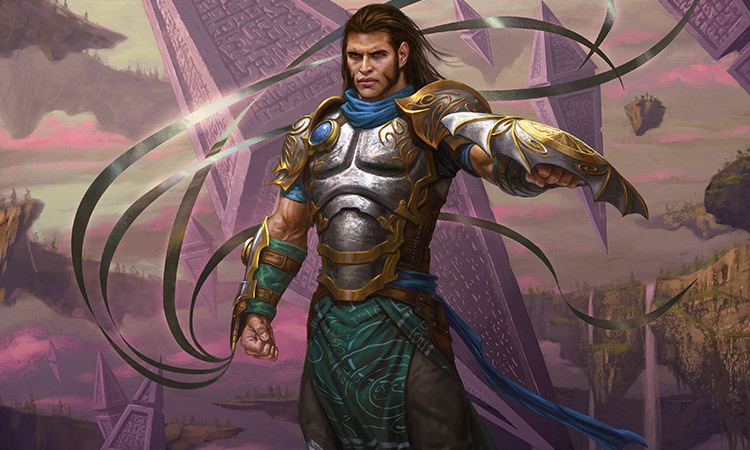 Gideon's mission had taken longer than he intended: Jace had had work to attend to on Ravnica, and Gideon had needed the attention of a healer. Then they had gone to Regatha in a fruitless effort to recruit Chandra Nalaar. And while they had delayed, the Eldrazi had apparently overwhelmed Vorik and his defenders. He spun on reflex and saw Jace crouching defensively as a pack of Eldrazi spawn spilled around the wreckage of a nearby wall, squelching and skittering as they moved. Gideon leaped between the Eldrazi and Jace. His sural swept around him, hurling the Eldrazi away, crashing them into each other and shattering the featureless, bony plates that passed for their heads. Then the camp lay silent again. Gideon snatched up a short, round-bladed sword that was half-buried in a pile of white dust. "Take this," he said, offering the hilt to Jace. For a moment Jace looked as if Gideon were handing him a snake, but then he took the blade and gave it a few swings through the air. "Not exactly my specialty," he said. "Do what you can," Gideon told him. "So where is this scholar you want me to talk to?" Gideon looked down at the much smaller man. "Is that all you can think of? Here? Now?" Jace shrugged, but something in his eyes told Gideon that the mind mage was just covering his own dismay. Gideon turned away. "We need to move," he said. He looked around to get the lay of the land. "Up the ravine. If anyone survived this, that's where they'll be." Even as he said them, he felt the weight of his words. What if no one had survived? If he had been here, the camp would not have fallen. To his credit, Jace nodded and drew closer, ready to follow where Gideon led. The ravine narrowed and rose sharply behind the camp. Scattered clumps of small Eldrazi ranged around the gully, leaving a spreading pattern of chalky meshwork behind them. Gideon suspected they were feeding, though he couldn't imagine what sustenance they could derive from the bare rock. His first inclination was to destroy all the Eldrazi he could see—but he had Jace to think about, and there was no time to lose in looking for any survivors from Vorik's camp. So he picked a path along the rocky ground that kept them away from the Eldrazi. Only the occasional Eldrazi veered from the bulk of its fellows to come at them. Gideon quickly dispatched those stragglers, and before long he crested a rocky ridge and his heart lifted. A wall blocked the ravine ahead, a rickety wooden barrier that looked like it had been torn from a shed and wedged into a choke point. Spears bristling over the top testified that some Zendikari, at least, had survived the slaughter at the refuge. 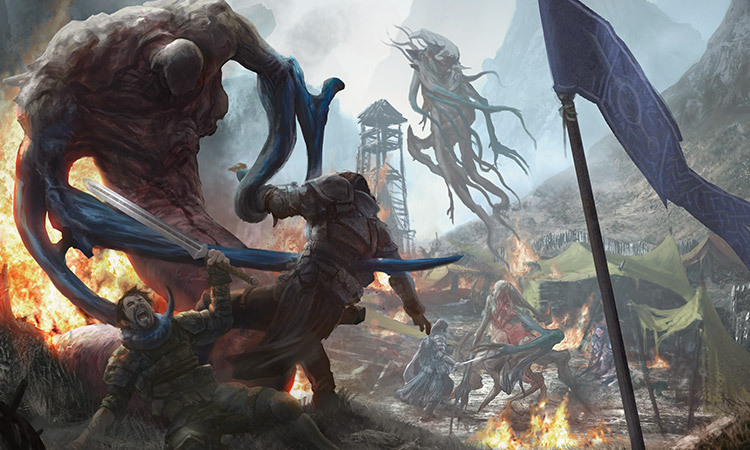 But between Gideon and those survivors, hundreds of Eldrazi crowded in front of the wall, reaching long tentacles and sharp claws up and over the top. The spears jabbed frantically at any Eldrazi that came within reach, but it was clear that the survivors were vastly outnumbered and outmatched. 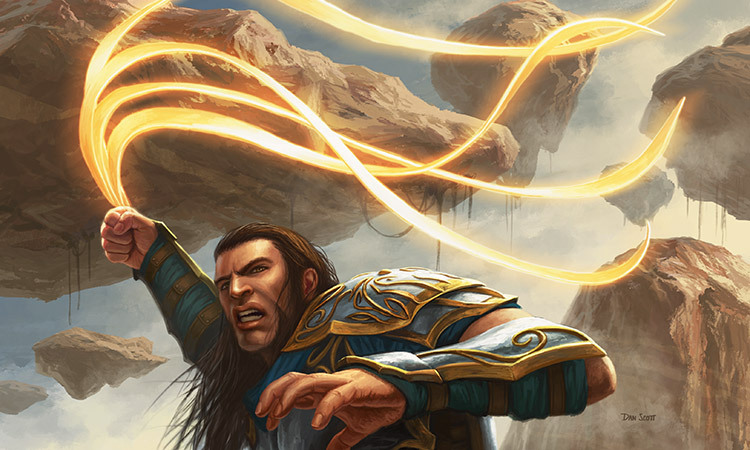 Gideon bellowed, "Zendikar!" and charged. His sural whirled around in front of him, clearing a path through the massed Eldrazi as he rushed toward the ramshackle wall. A lone voice from behind the barricade echoed his cry, followed by a ragged chorus as spears jabbed out with renewed vigor. "Gideon!" someone shouted. His first thought was to shoot a glance over his shoulder—he had all but forgotten Jace in his eagerness to reach the survivors. But Jace was right behind him. The shout had come from behind the wall, and again it was picked up by a group, even louder than the first. He reached the wall and whipped his sural back and forth as the Eldrazi continued to press the assault. Gideon's sural swept in a wide arc to clear them some space. Then he laced his fingers together and nodded to Jace. "Up you go." Jace had missed his chance. The Eldrazi crowded close again. A surge of them from his left drew his attention for a second too long—when he whirled to his right, he saw a wriggling spawn lunging at Jace. Gideon was too slow. Jace threw his arms up to cover his face—and some unseen force pushed the creature back an instant before it could skewer him with a sharp appendage. It wasn't a powerful blow, but it was enough that Gideon had time to get his sural around the Eldrazi's neck. Then Jace staggered and yelped as a sickly blue tentacle coiled around his leg. Gideon lifted the first Eldrazi into the air and smashed it down on the tentacled one. "Are you all right?" he asked Jace. Jace nodded and his eyes flickered with blue light as another spawn scuttled away from him, knocked back by what must have been a telekinetic blow. Again Gideon swept his sural back and forth to clear a path. 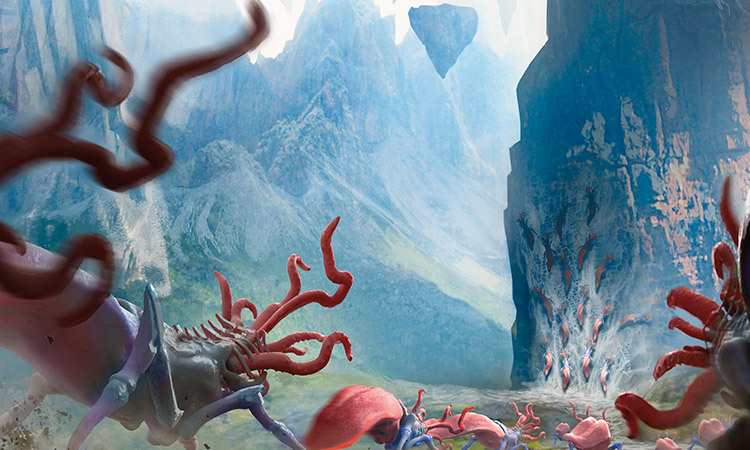 Eldrazi bodies were piling up, slowing the advance of the rest of the swarm. He laced his fingers again, and this time Jace promptly put a foot in place. Gideon heaved him up and a hand from the other side of the wall helped him over. His back to the wall, Gideon faced the remaining mob—squirming spawn and faceless drones, bestial extensions of their titan sire's alien will, of Ulamog's unending hunger. These creatures didn't know who stood before them. They didn't care that he was Gideon Jura, the savior of Fort Keff, the great hunter of Ondu, the champion of Kabira. To them, he was just another piece of flesh, a thing with life to be drained away. But the people behind the barrier knew. He was hope to them, their one chance to survive this dire threat, their salvation and deliverance. That was what he had been to countless soldiers across Zendikar, and now he had to do it again. "I just hope I'm not too late," he said to himself. He stood his ground and fought, sweeping his sural back and forth, his mind preoccupied with talking to the survivors and getting Jace safely to Jori En. "Gideon!" came another chorus from behind the wall. It was time. A larger spawn with heavy bone plates on its head came rushing toward him. He crouched, awaiting the perfect moment, then jumped. One foot came down hard on the Eldrazi's head, then he leaped up, flipped backward, and vaulted over the wall. His feet kicked up clouds of dust as he landed and laid eyes on the survivors of Vorik's camp. Eight haggard soldiers sat with their backs against the wall, evidently enjoying the moment of respite that Gideon had brought them. A skittering and clawing at the wall told them that respite was over, and they pulled themselves to their feet again, leaning on their spears for support. Gideon's sural knocked an Eldrazi off the top of the wall. "Tell me you're not the only survivors," he said. One of the soldiers, a kor, jerked her head toward the higher end of the ravine. "Commander Vorik is leading the rest," she said. "But most of them are worse off than we are." Considering the array of bandages and splints that adorned these eight soldiers, that said a great deal. Gideon frowned. The woman shook her head. "A few dozen." "I should have been here," Gideon said under his breath. She made a half-hearted jab with her spear at an Eldrazi coming over the wall, her face telling Gideon that she was only pretending not to have heard him. "Does Vorik have a plan? Where is he taking them?" "I think getting out of this death trap of a ravine is his first objective. I'm not sure he's thought beyond that." Jace snorted. "What kind of leader—" he began. "No, he's right," Gideon said. "We all need to get out of this ravine. I'll hold this wall as long as I can." His sural punctuated his words as more Eldrazi fell dead at his feet. "Go rejoin the others, and take Jace with you." The kor nodded, not bothering to hide her relief. And, Gideon noted, not bothering to question whether he could hold the wall for long. His reputation had spread widely. "Jace," he said, "when you get to the others, look for a merfolk named Jori En. Tell her I brought you to help with the puzzle, and she'll give you everything she knows." "Assuming she's still alive," Jace said. Dread knotted Gideon's stomach. He hadn't wanted to put that doubt into words. He hadn't seen Jori En among the dead in the camp down below, but that didn't mean anything. She could be dust blowing in the wind, or perhaps she never escaped Sea Gate at all. Maybe he had brought Jace all the way here for nothing. Which made Gideon's prolonged absence all the more inexcusable. He tasted bile. "Go!" he shouted, and the soldiers limped away from the wall as fast as they could manage. Without having to worry about Jace, Gideon could give the Eldrazi his full attention. Now that the soldiers had left, the Eldrazi scuttled over and around the wall faster than Gideon could strike them down. He fell into an easy rhythm of slaughter, a dance that had become second nature to his muscles. His sural cracked and whistled, golden light gleaming along the length of the four whip-like blades as he channeled his magic through it. His buckler alternately deflected blows and became a weapon itself, smashing into bony plates and breaking limbs. And ripples of energy washed across his skin where the Eldrazi threatened to touch him, warding him from harm. As much as he hated to admit it, if Jace had not dragged him to see that healer in Ravnica the night before, he might not have been much help in the camp's defense anyway. He might have been dead. He glanced over his shoulder as the Eldrazi corpses piled up around him. Jace and the Zendikari were out of sight. And in front of him, it seemed like the Eldrazi advance was beginning to slow. Which might just mean they had found an easier route to the tasty morsels of Zendikari flesh behind him. He started backing his way up the ravine, his sural gripping and slicing at the Eldrazi that followed him. 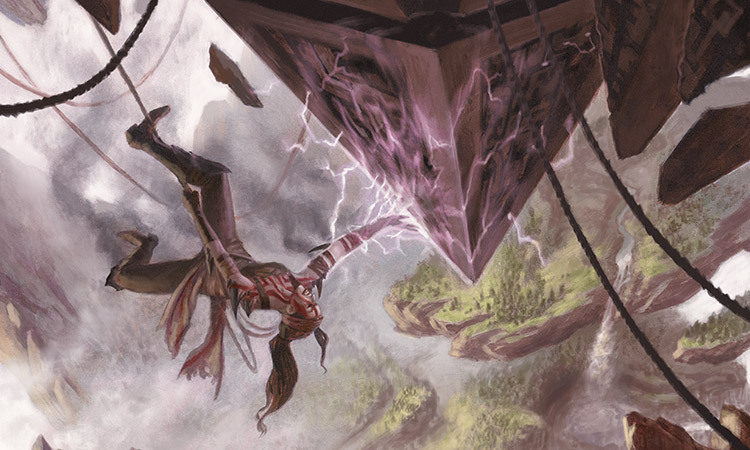 Occasionally, too, he struck high on the side of the ravine, sending a shower of gravel or a few larger chunks of rock down onto the Eldrazi. 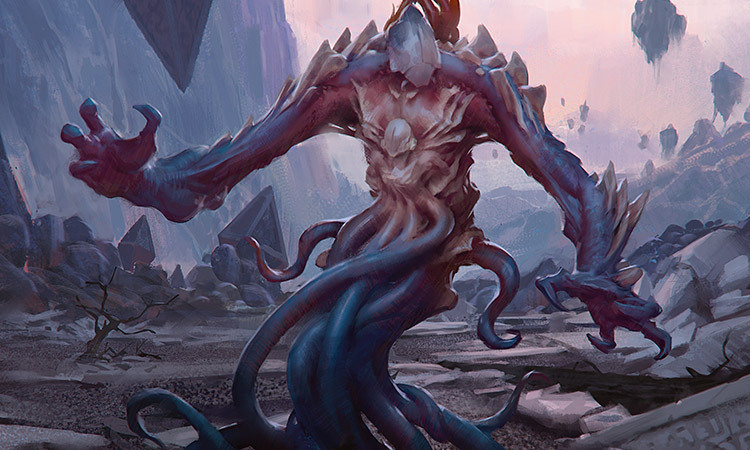 Then a huge Eldrazi surged up behind him—not Ulamog, but something very like the enormous titan. It had no legs, just a writhing mass of tentacles, and it pulled itself along the broken ground with its arms, making the ground quiver each time a huge, clawed hand struck the ground. Bony plates ran up the backs of its arms and covered its shoulders, so its head was just one more plate among many. A tangle of tentacles reached skyward from just behind its head. One great claw hit the ground, squashing a slithering spawn in an eruption of purplish slime. Neither it nor the surrounding spawn paid any heed. Gideon planted his feet and took a deep breath, steeling himself. How do you win a war, he wondered, when the enemy has no fear of death and nothing to lose? They never tired, they apparently fed on everything—so what would ever stop their advance? How many had he killed here in this ravine, just today? And still they kept coming. Now the Eldrazi lifted its upper body so it loomed over Gideon, more than twice his height. What looked almost like a second head and torso protruded forward from the thing's chest, squirming independently of the larger body as if trying to pull itself free. Did it mean to scare him, showing off its much greater size? Or was this more of an animalistic threat display, like a wolf's bristling fur making it look larger? Was there some calculated intent behind that bony plated head? It didn't matter. One of those great claws came swinging toward Gideon. With the barest movement of his arm, he wrapped his sural around the creature's hand, then he pulled, yanking the Eldrazi off balance. No. That move would have pulled a human off balance, or even a giant. But the Eldrazi's tentacles barely shifted on the ground, keeping it perfectly grounded. Without hesitation, it grabbed at him with its other claw. He batted the claw aside with his buckler and lashed his sural upward, where it slashed and coiled at the creature's neck. Neck? Head? He wasn't sure the words even made sense when applied to an Eldrazi. Did it draw air from some opening in its head, down its neck to lungs in its chest? Was its brain located behind that bony plate at the top of its body? Did it even have a brain, or lungs, or a heart, or any vital and vulnerable organs? For all the Eldrazi he had killed, he had never cut one open and studied its anatomy, and he'd seen many continue to fight despite what he would have assumed to be mortal wounds. And this one seemed unconcerned as Gideon's sural tightened around its neck. The mass of tentacles supporting the creature surged forward and engulfed him, coiling around him and squeezing. Golden light shimmered and rippled over his entire body, protecting him from injury, but maintaining that shield would drain his energy as quickly as the Eldrazi would squeeze the breath from his body if he let it down. Kicking and thrashing, he managed to loosen the creature's hold enough that he could pull on his sural, dragging the Eldrazi's head down. Then, on a hunch, he brought his shield hand up to punch the smaller second head that grew from its chest. It was a good hunch. The tentacles loosed their grip. Gideon pulled his sural free from the Eldrazi's neck, and the creature staggered backward, depositing him on the ground. Two more quick slashes with the glowing blades severed first the smaller head and then the larger, and the Eldrazi fell dead to the ground. Gideon had no time to celebrate his victory. 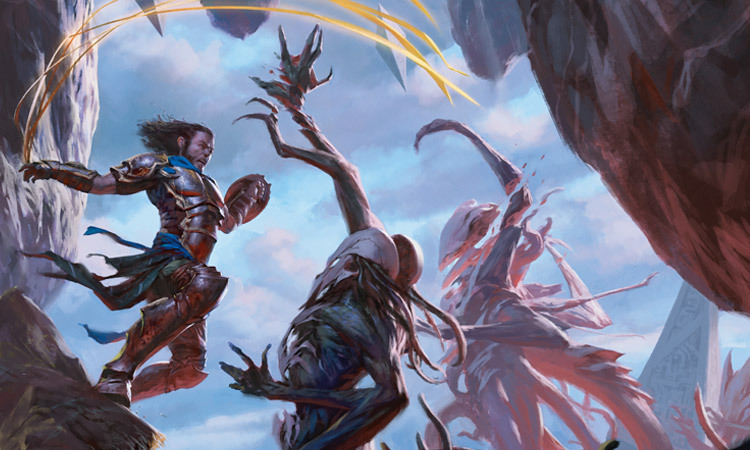 While he had fought the larger Eldrazi, at least a dozen spawn had skittered past him, following Jace and the Zendikari soldiers up toward the other survivors, and more were advancing with every passing second, swarming over the Eldrazi corpse. Sweeping his sural through every crawling and squirming spawn he could reach, he strode up the ravine. The rocky ravine walls grew closer and closer together as the ground rose. At last, his body spattered with ooze and gore from dozens of Eldrazi spawn, he reached a narrow choke point where bare stone walls opened just wide enough for him to pass through. He jumped up a few natural stone steps and paused for a moment in the narrow gap, surveying the crowd of spawn that still surged up the ravine behind him. He ran a few more strides past the gap. As the ravine opened up again, he stopped, turned, and lashed out with his sural—once, twice—striking the rock walls and breaking rubble from both sides of the gap to shower down on the Eldrazi below. More strikes, the whip-like blades cracking like a miner's pick on the stone, and larger stones were sheared from the walls, squashing more spawn and blocking the advance of the ones behind. A few more hits, carefully placed, and he had created a defensive wall. It would not hold, of course—not any better than the one the Zendikari had erected in their retreat. He could hear the Eldrazi scuttling and scraping at the boulders, shifting the rubble as they started to climb. But with any luck, the wall would buy him enough time. He took off at a run, leaping from stone to stone as he neared the top of the ravine. Then, at last, he heard a woman's voice shouting orders, and a moment later the Zendikari survivors came into view. "So few," he said to himself. A few dozen, the soldier had said—very few, if he was seeing the whole group. From the top of the ravine, they were making their way along a high ridge. He saw many crutches, many makeshift stretchers held by limping soldiers, and bandages on almost every living body. Jace's blue cloak stood out among the grays and browns, the plain fabrics and dirt-caked clothes of the Zendikari. The mind mage was standing beside an armored human woman. Gideon hurried to join them. "You made it," Jace said. Was that a touch of admiration in his voice? The woman turned to face him, and her eyebrows rose in recognition. "You must be Gideon," she said. "Did you find her?" he asked Jace. "Jori En?" Jace shook his head. "I asked everyone." "Did she . . . Was she—"
"She never got to the camp. One of the merfolk said she never got out of Sea Gate." Gideon's chest clenched. "She died there?" He had left her in the middle of the battle, abandoned her to make her own way to the camp while he went to find Jace. If she was dead, it was his fault. "Probably," Jace said. "But perhaps not. The man I talked to said that a small group got trapped, cut off from the evacuation. He thinks Jori En was among them, and they might have found shelter." "So they could still be alive. They could still be in Sea Gate." His shoulders sagged at the thought of what he had to do next. The woman cleared her throat. "I'm Tazri," she said. She was a brown-skinned woman in elaborate plate armor, adorned with small wings at her shoulders and a glowing metal ring like an angel's halo, but around her neck. A heavy, flanged mace hung at her belt. "Sorry," Gideon said. He extended his hand, the blades of his sural trailing on the ground. She took his hand gingerly, eyeing his weapon. "I'm glad you're here." "Where is Commander Vorik?" Gideon asked. "Right here," came a hoarse voice from behind Tazri. Tazri turned, and Gideon saw Vorik. He was a strongly built man with deep brown skin and curly gray hair cropped short. His shirtless chest was wrapped in bandages, and some blood had seeped through them at his left side. He leaned on a staff as he shuffled toward them. "Hello, Gideon," he said, his voice a harsh whisper. "Sir," Gideon said, keeping his concern out of his tone. Vorik was a proud man, and Gideon knew better than to patronize him. "We don't have much time. I slowed the Eldrazi advance, but I couldn't stop it." "Gideon Jura, the savior of Fort Keff," Vorik said, a touch of wonder in his voice. "Perhaps now we'll call you the defender of Vorik's gully." Gideon looked at the ground. "I should have been here earlier." "Yes," Vorik said flatly. "We could have used you." Vorik heaved a deep sigh. "What can we do but keep running? About three miles down this ridge, there's another fallen hedron in front of a large overhang. That'll make as good a camp as any." Gideon frowned. "A protected entrance is good. But no way out?" "If we can't hold them back from in there, we're doomed anyway. There's no way we can outrun them, even if the great defender of Vorik's gully stays around this time." Gideon looked around the ridge, rubbing his chin. They stood at the crest of the Bulwark, the great ring of mountains that encircled Tazeem, though the ring was lower here, close to Sea Gate, than it was on the other side of the island. To his right, the land sloped gradually down to the Halimar, the great inner sea, fed by Tazeem's many rivers and held in place by the enormous dam that was the city of Sea Gate. To the left, a much sharper slope led down to the ocean. The curve of the land and the tangled trees of the Vastwood shielded Sea Gate from view. A few hedrons hung motionless in the air nearby, fallen only halfway from the floating hedron field high above Tazeem to the sea below. Gideon let his gaze drift up to the hedron field. Ropes dangled from several of the lower hedrons and connected some of the ones that hovered in the sky. "I have another idea," he said. Vorik frowned at him. "You know a better place?" "I think I do. Look." He pointed at the nearest hedron. "There's practically a staircase waiting for us." "Have you gone mad?" Tazri said. "You have two dozen people here who can barely walk, and you expect them to climb ropes and perch on hedrons?" "Yes. For many of them, it will be easier than walking. And with enough hooks and ropes, we can help the others up." He turned back to Vorik. "Sir, with the sheer number of Eldrazi on the ground here, I believe there's no other place that can offer a similar level of protection." "Fine," Vorik said. "Lead the way." Tazri gaped at her commander. "Sir?" "Gideon is right, Tazri," Vorik said. "Help him get the people ready." Together, Gideon and Tazri worked quickly, despite her reservations. First they talked to the kor among the survivors, drawing on their skill with ropes. While some kor worked to build harnesses and slings that could carry the wounded up the heights, others scouted the path and fixed ropes in place to ease the ascent. Then they distributed what meager supplies the survivors had managed to take with them from Sea Gate and the destroyed refuge, giving heavier burdens to those who were strong enough to carry them. In just a few hours, they were ready to begin the climb. The kor scouts led the way, with Gideon right behind them. He used his sural much as they used their ropes, though its whip-like blades weren't as long. He lacked their slender grace, but made up for it with strength and speed. Jace, though, was not a skilled climber nor an athlete of any sort. He trailed behind Gideon, offering meager assistance to the kor who were carrying those too injured to move themselves. Most of the hedrons, tilted askew in the air, offered a relatively smooth and level surface to move along. It was easiest to crawl—which was the reason Gideon had said it might be easier than walking for some of the wounded. Crossing on ropes between hedrons was more challenging, as an act of both balance and courage. But these were hardy folk, accustomed to life on Zendikar with all its dangers. They made the ascent with no complaints, no missteps, and no further injuries. Gideon stared long and hard at Sea Gate. Even at this distance, he could see the Eldrazi corruption spreading across the city. Buildings had crumbled to dust or turned into elaborate chalky meshwork. The great dam, which held in the waters of the Halimar, showed no signs of that corruption yet. But how long would it continue to hold? How long would its lighthouse stand? "So now what?" Jace asked, startling him out of his musings. "Jori En could still be there," he said, nodding toward the city. "I have to go find her." If he couldn't find her, then it was all for nothing. He had abandoned Sea Gate to go find Jace so Jace could help Jori solve a magical puzzle. Spending that time with Jace had meant that he wasn't at Vorik's camp when the Eldrazi came, and all those people had died. If he couldn't find her, they had died for nothing. "Unlikely," Jace said gently. "Given what we know, she is probably dead. We should find another approach." "You should," Gideon said. "We don't have Jori's notes, but maybe you can figure out what she was talking about. She said leylines and hedrons. Plenty of hedrons around—see what you can learn. And I'll find Jori En and bring her back here." "It's a fool's errand," Jace said, as Gideon had known he would. "It doesn't matter. I have to find her. If I don't, then what was all this for? Why did I bring you here at all, when I could have been here defending the camp from the beginning? If you and Jori En don't solve this puzzle of hers, then it was all for nothing." "It's all for nothing if you die trying to find her in a city teeming with Eldrazi." "Jace." Gideon put a hand on the mind mage's shoulder. "Look at what we've done today. Greater deeds lie ahead for both of us. Trust me." Jace squirmed out from under his hand, stepped back out of reach, and met his gaze. He opened his mouth to speak, then paused. "Trust me," Gideon said again. "I do," Jace said, with a touch of wonder in his voice. "I still think it's foolish, but I do." "Thank you. I'll be back as soon as I can." "I believe you will," Jace said. "Good luck." "You too." He turned away and walked along the edge of the hedron face, making a wide circle around the camp until he reached the rope leading downward. Luck, skill, the power of his magic, the lessons of his training—Gideon would need them all, surely. "I have to do this," he told himself, gripping the rope. "They can't have died for nothing."